Rock Hudson, Mia Farrow, Robert Forster, Jeanette Nolan, Rick Moses. 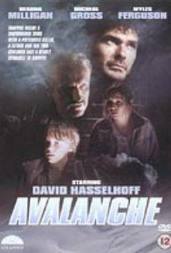 Avalanche is a moderately big names short disaster quickie and its avalanche sequences are the best, a good blend of authentic snow footage and special effects. The conventional human interest is too brief, too tawdry to evoke sympathy for the protagonists. Some social, conservationist points are made and the parable of the man building bigger barns comes to minds. Rock Hudson, older and slightly gruffer, fails in his palatial ski resort ambitions and in exercising enough charm over his ex-wife, an unlikely Mia Farrow (who has to dangle precipitously from a shattered bridge). Robert Forster is the mouthpiece of good and, almost momentarily, the "other man". A reasonable idea that needs more development. 1. An interesting and enjoyable film? As an example of the disaster genre? Expectations of the conventions? The title? 2. The presentation of Colorado, the mountains and snow, skiing, the buildings, the recreation opportunities for people, the visualising of the avalanche and its effect? Technical skills, real footage, contrived and studio photography? 3. The brevity of the film and the effect of this. especially on the human motivations and characters? What was the priority of the screenplay, disaster, character study? 4. The sketching of the situation: the skiing sequence.5, the new hotel and its building, the new how, the drive and ambition of the owner, conservation issues and dangers e.g. the skier pursued by the avalanche and leaping to safety? The scientific background and its plausibility? 5. Rock Hudson as hero? Personality, style, in himself? His relationship with his ex-wife and trying to persuade her to stay yet going off to business meetings,, his roving eye? Fond relationship with his mother? The pressures of getting everything ready, the ambitions of the invitations and the skiing and skating show? His ignoring warnings? Getting his friend to come by plane and its crashing with the repercussions for the avalanche? His wanting to get his own way? Relating with his staff, with his advisers. workers? How much of the avalanche was his responsibility? 6. Robert Forster and the tests, as a commercial photographer causing the avalanche as a test? His relationship with the wife? His warnings, role in the rescue? How well sketched as a character? The importance of his function in the film? 7. Mia Farrow as the wife? Her return, reaction to her ex-husband and his continually going off to business, bond with his mother? Her choices at the party., spending the night with the photographer? The experience of the avalanche, the escape? Helping the mother, the ambulance and going over the bridge, her dangling and the rescue? Her returning to say goodbye and her decision to leave? A credible character, behaviour and motivation? 8. The group of skiers presented in action,, the skating demonstration, rivalry, neuroses? Divorces? The party, attitude towards sexuality e.g. the skier and the young girls, the discovery by the wife and her going berserk etc.? Personal behaviour, morals., the sleazier side of human beings? 9. The visual presentation of the avalanche - causes, effects, burying, smashing and freezing? The audience response to the avalanche in fear and danger? 10. The people involved and their deaths, so many, the boy and the television production manager on the ski seat and their eventually being saved, the TV crew filming this. the boy and the jumping, the manager and his death? The mother and the lawyer buried in the snow and being rescued? The skier buried and the men prodding in the snow etc? 11. The effect of the bridge, the ambulance over the bridge and the rescue of the wife? Far-fetched, heroics? 12. What was the audience left with the moral of the story, the social comment? Human behaviour? The parable of the man with ambitions and achieving success and having it all taken away? A short effective disaster film or not?